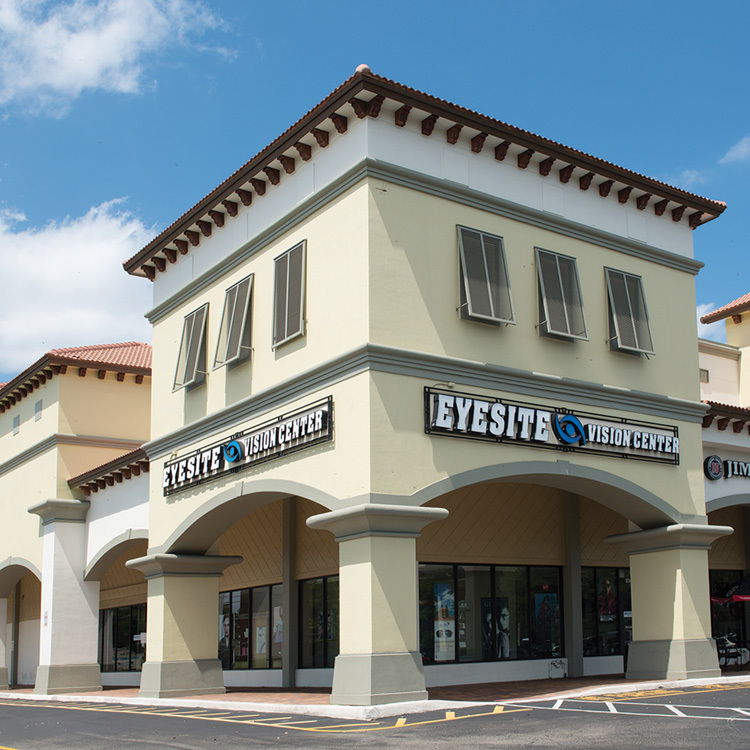 Eye Site Vision Center in Coral Springs has been a leader in eye care and frame fashion since 1998, more than 20 years! Dr. Gary Goberville is the caring physician at the center of the practice. The beautiful facility is one of three offices (Coral Springs, Boca Raton, and Lighthouse Point). The offices are run by the Doctor, several knowledgeable and friendly assistants, and two other part-time optometrists. Having finished his undergraduate studies at the University of Florida and Tulane and then going on to the New England College of Optometry in Boston, Dr. Goberville tells us, “I played a few years of football in college and also played semi-pro volleyball. My son plays baseball now, so I’m very involved in sports.” So much so that Dr. Goberville has been exclusively selected to do the vision screening for all of the athletes in the Florida Atlantic University sports programs. “I became an optometrist to help people and my patients function in life better,” he says humbly. “When they can see better, it’s very important for their lifestyle… and for kids, it’s essential to have the best vision possible. With better vision, they are able to learn and perform easier. Many studies show that kids learn better when they can see more clearly.” It sounds logical, but many small children who show delays are simply hindered by their inability to see properly. Dr. Goberville’s compassion for others and his desire to help them live to their utmost ability is clearly elucidated in his practice. “What we do is important and there are a lot of things that can occur in the eye. 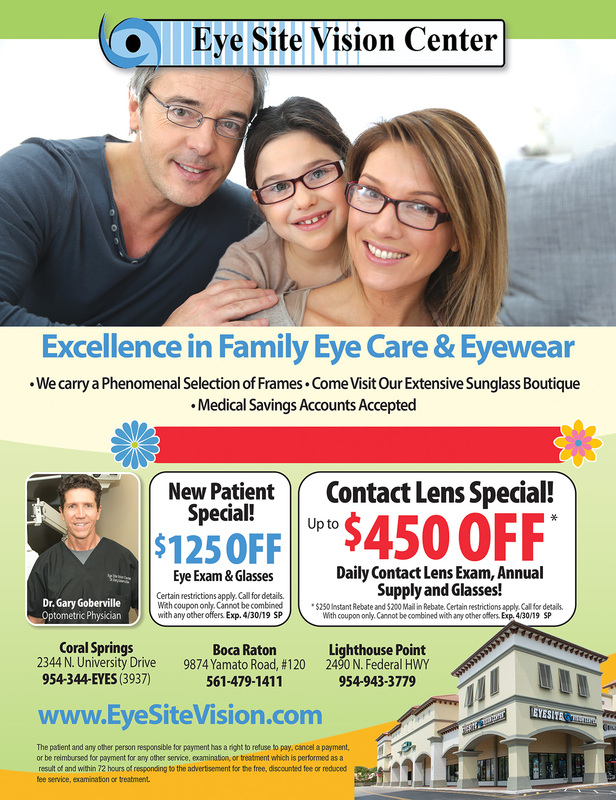 We want to be sure our patients have a good vision for years to come.” Qualified and eager to offer comprehensive, personalized care to every family member, from the youngest child to the eldest grandparent, trust the staff at Eye Site Vision Center to advise and treat everyone as their most important patient. With an extensive selection of glasses and sunglasses that stands out for its high quality, fair prices and exclusive choices, Dr. Goberville is proud of the variety available at his office. “We have designers like Om Ford, Fendi, Christian Dior, Paul & Joe, Gucci, Coach, Chrome Hearts, Tiffany, Prada, Ray-Ban, Lafont and some exclusive brands. We have frames to fit any budget as well. We also make our own, state of the art lenses with quick turn-around and guaranteed low prices.” And if you have frames that you just can’t bear to part with, but are in need of an updated prescription, Eye Site Vision Center is one of few places that is qualified to manufacture new lenses to fit your favorite frames.